On March 23, the Supreme Court formally heard arguments in a case that may carry dire consequences for religious groups in the United States. Perhaps the most well-known of these religious groups is the Little Sisters of the Poor, a group of Catholic nuns who operate homes for the elderly poor. Under the Affordable Care Act, the United States Department of Health and Human Services has tried to enforce provisions that would require employers of companies and non-profits to provide insured health coverage of contraception and abortifacients. Recently, the company Hobby Lobby was granted an exemption to this ruling, but the HHS Department is still seeking compliance from many non-profit religious groups. After their case was denied in lower courts, the Little Sisters’ case was bundled in with many other similar cases from various religious groups across the country, to be presented in whole to the Supreme Court for a final ruling. “Many groups were very concerned about what the government was doing and what its plans were, and so we had the opportunity to represent the Little Sisters and we’re honored to be able to do that,” said Lori Windham, a senior attorney representing the case of the religious groups seeking the exemption. Windham is senior counsel for the Becket Fund, a non-profit law firm which represents a diverse range of faith-based clients in religious freedom issues. The Becket Fund was the first group to file a lawsuit against the HHS Mandate on behalf of Belmont Abbey College, a client that is now also awaiting the decision of the Supreme Court. Now, representatives of the Department of Health and Human Services are arguing that all the Little Sisters must do is simply sign a simple form “opting out” of contraceptive coverage. But according to the Becket Fund, this form would still require the religious groups’ insurance plans to cover or reimburse contraceptive expenses. Even more stunning is the fact that 1 in 3 Americans are covered by insurance plans that do not have to comply with the HHS Mandate, and that the government has declined to force these insurance providers to cover contraceptives in the same manner as they pressure religious groups. Pepsi, Exxon Mobile, and Tricare, the insurance provider for the US Military, were grandfathered in after the passing of the Affordable Care Act. It was ruled that each of these groups met the minimum required standard of care, even when that standard did not necessarily cover family planning services. According to Windham, each of these companies and government agencies has been allowed to designate their own standards of coverage for contraceptives and been ignored, while small, faith-based groups have been ruthlessly threatened with fines and consequences for non-compliance. 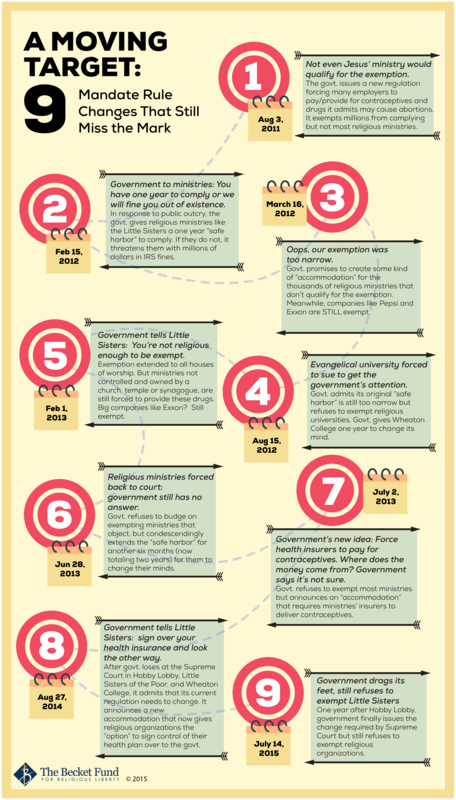 Infographic courtesy of the Becket Fund. For Windham and the religious groups represented by the Becket Fund, this case is about more than simply not providing coverage for contraceptives; the entire issue is one of religious freedom. Dr. Ann Church is an obstetrician and gynecologist practicing in Grants, NM. For many years she took a neutral position on the subject of birth control and abortion, but has since embraced a completely pro-life perspective. The relationship between individual medical choices and an organization’s religious objections is relevant to her own practice. Many religious groups who are not being represented in the case, and who may hold different opinions on the subject of contraception and abortion, have also spoken up in support of the Little Sisters. Some of Windham’s past clients have included a Santeria priest and a group of Amish builders. One thing each of her clients has in common is a cherished belief in religious freedom. “You have these minority faith groups come together to say that while they didn’t necessarily share the Little Sisters’ beliefs, they share their interest in religious freedom for all Americans,” Windham said. Several of the groups represented in the upcoming Supreme Court case are non-Christian, including a group of Orthodox Rabbis. While religious freedom is commonly agreed upon to be an important right, what about the rights of women who wish to obtain family planning services? Opponents in the case often state that a lack of contraceptive coverage would place a burden on women, particularly those in lower-income brackets. According to Dr. Church, a large network of public, private and even corporate systems are already in place to provide that coverage. Many of these options do require a prescription or visit to a healthcare provider, but those can be attained fairly easily. 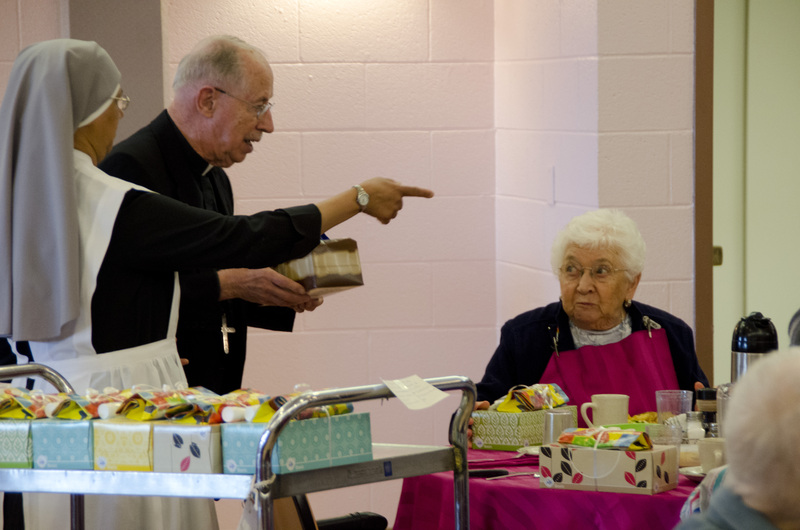 The sisters joined together with priests from the Diocese to distribute gifts and serve the noon meal to residents on the Feast of St. Joseph. Dr. Church also highlighted two troubling aspects of the case: the tenuous, and sometimes nonexistent, difference between contraceptives and abortifacients, as well as future ramifications for other conscience-based objectors. Dr. Church herself promotes Natural Family Planning, a method of family planning officially endorsed by the Catholic Church. But if the Becket Fund loses their case, she envisions a future where her own moral objections to contraception could be brushed aside. Windham believes this worry is well-founded, especially from a legal standpoint. She remains optimistic, even with the recent death of Justice Antonin Scalia, that the Supreme Court will continue to uphold the rights of religious groups. Although the case is being presented on behalf of a wide variety of groups, the outcome will still be felt in the Diocese of Gallup. The Little Sisters of the Poor have operated a home in Gallup since 1985. Most of their employees, volunteers, and residents are Native American. Sr. Mildred is a smiling, happy woman, and one of the sisters who helped to spread the word about a special day of prayer held on March 15th by homes throughout the province, along with a 12-hour block of Eucharistic Adoration. 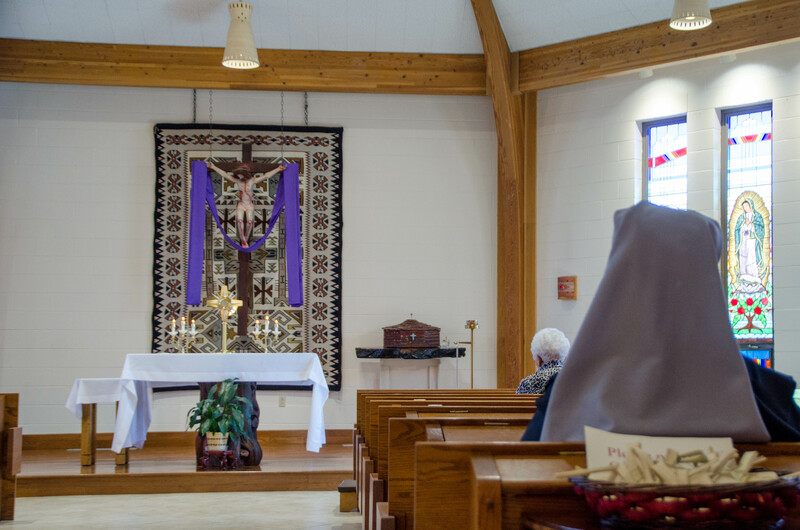 Sisters and residents of the home in Gallup held a day of Adoration and prayer for their upcoming Supreme Court case. And while religious freedom is the large issue represented by the case, on a very personal level, the Sisters express a simple desire: to love and care for the poor.